Rocks become magnetized in a variety of ways (see Chapter 7). Both igneous and sedimentary rocks can be affected by chemical change, thereby acquiring a secondary magnetization. Many magnetic materials are affected by viscous remanent magnetization. The various components of magnetization sum together to constitute the NRM which is the “raw” remanence of the sample after extraction. The goal of paleomagnetic laboratory work is to isolate the various components of remanence and to ascribe origin, age and reliability to these components. But before the laboratory work can begin, samples must be collected. Sampling strategy is crucial to a successful study. In this chapter, we will briefly describe techniques for sampling, methods of orientation and overall philosophy. We will then turn to an overview of some of the more useful field and laboratory techniques that wind up with an estimate of a paleomagnetic direction. There are several goals in paleomagnetic sampling: one is to average out the errors involved in the sampling process itself, and to assess the reliability of the recording medium (recording noise). In addition, we often wish to sample the range of secular variation of the geomagnetic field in order to average it out or characterize its statistical properties. The objectives of averaging recording and sampling “noise” are achieved by taking a number N of individually oriented samples from a single unit (called a site). Samples should be taken such that they represent a single time horizon, that is, they are from a single cooling unit or the same sedimentary horizon. The most careful sample orientation procedure has an uncertainty of several degrees. Precision is gained proportional to , so to improve the precision, multiple individually oriented samples are required. The number of samples taken should be tailored to the particular project at hand. If one wishes to know polarity, perhaps three samples would be sufficient (these would be taken primarily to assess recording noise). If, on the other hand, one wished to make inferences about secular variation of the geomagnetic field, more samples would be necessary to suppress sampling noise. Some applications in paleomagnetism require that the secular variation of the geomagnetic field (the paleomagnetic “noise”) be averaged in order to determine the time-averaged field direction. The geomagnetic field varies with time constants ranging from milliseconds to millions of years. It is a reasonable first order approximation to assume that, when averaged over, say, 104 or 105 years, the geomagnetic field is similar to that of a geocentric axial dipole (equivalent to the field that would be produced by a bar magnet at the center of the Earth, aligned with the spin axis; see Chapter 2). Thus, when a time-averaged field direction is required, enough sites must be sampled to span sufficient time to achieve this goal. A general rule of thumb would be to aim for about ten sites (each with nine to ten samples), spanning 100,000 years. If the distribution of geomagnetic field vectors is desired, then more like 100 sites are necessary. Figure 9.1: Sampling technique with a water-cooled drill. [Photos of Daniel Staudigel.] a) Drill the sample. b) Insert a non-magnetic slotted tube with an adjustable platform around the sample. Rotate the slot to the upper side of the sample. Note the azimuth and plunge of the drill direction (into the outcrop) with a sun and/or magnetic compass and inclinometer. Mark the sample through the slot with a brass or copper wire. c) Extract the sample. d) Make a permanent arrow on the upper side of the sample in the direction of drilling and label the sample with the sample name. Make a note of the name and orientation of the arrow in a field notebook. 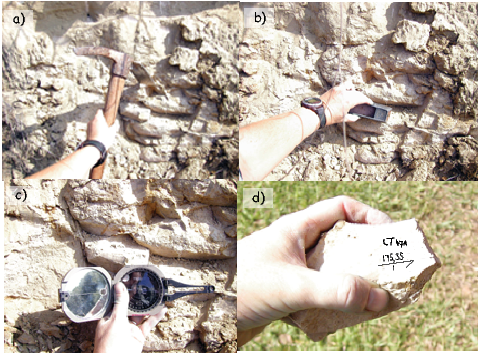 Figure 9.2: Hand sampling technique for soft sediment: a) Dig down to fresh material. b) Rasp off a flat surface. c) Mark the strike and dip on the sample. d) Extract the sample and label it. Samples can be taken using a gasoline or electric powered drill, as “hand samples” (also known as “block samples” or as “sub-samples”) from a piston core. Samples cored with portable drill. The most common type of paleomagnetic sample is collected by using a gasoline-powered portable drilling apparatus with a water-cooled diamond bit (Figure 9.1a). The diameter of cores is usually ~2.5 cm. 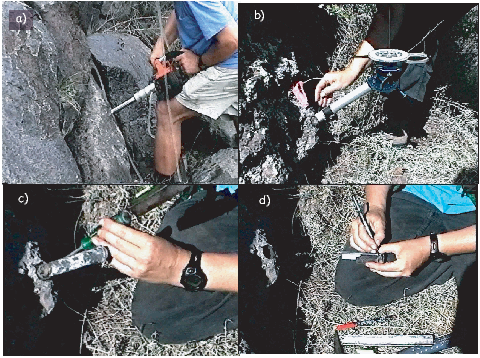 After drilling into the outcrop to a depth of 6 to 12 cm, an orientation device is slipped over the sample while it is still attached to the outcrop at its base (Figure 9.1b and Figure 9.4). Orientation devices have an inclinometer for determining dip (angle from the horizontal down or up) or the hade (angle from the vertical down direction) of the core axis. They also have a magnetic and/or sun compass for determining azimuth of core axis. The accuracy of orientation by such methods is about �3∘. A fiducial mark is scratched on to the core with a brass wire (Figure 9.1b), or if the core has broken free, a mark is made on the outcrop and transferred to the core (with a degradation of accuracy in orientation). 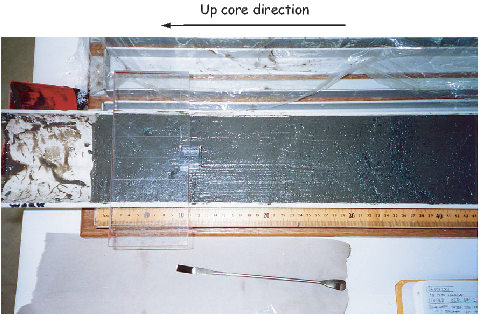 After orientation, the core is broken from the outcrop (Figure 9.1c), marked for orientation and identification (Figure 9.1d), and returned to the laboratory. Advantages of the coring technique are the ability to obtain samples from a wide variety of natural or artificial exposures and accurate orientation. Disadvantages include the necessity of transporting heavy fluids (water and gasoline) to the sampling site, dependence on performance of the drilling apparatus (often in remote locations), and herniated disks, damaged shoulders and hearing loss suffered by inveterate drillers. Block samples. In some locations or with particular lithologies that are not easily drilled, logistics (or laws) might demand collection of oriented block samples. Some samples can be shaved with a hand rasp to create a flat surface which can be oriented (e.g., Figure 9.2). Joint blocks are often oriented (generally by determining the strike and dip of a surface) and then removed from the outcrop. 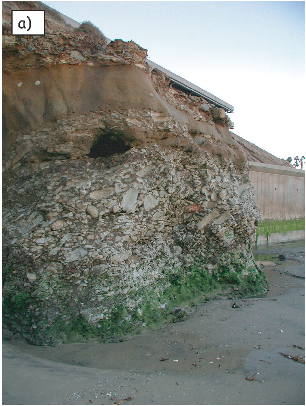 For unlithified sediments, samples may be carved from the outcrop (see also Schnepp et al., 2008). Advantages of block sampling are freedom from reliance on coring apparatus and the ability to collect lithologies that are unsuitable for coring. There are, however, conspicuous disadvantages: limited accuracy of orientation, the need to collect joint blocks (likely more weathered than massive portions of outcrops), and the need to transport large numbers of cumbersome block samples out of the field and later subsample or sand these to obtain specimens. Figure 9.4: Orientation system for sample collected by portable core drill. a) Schematic representation of core sample in situ. The Z axis points into outcrop; the Xaxis is perpendicular to Z and is in the vertical plane; the Y axis in the horizontal plane and is positive to the right of X. b) Orientation angles for core samples. The angles measured are the hade of the Z axis (angle of Z from vertical) and geographic azimuth of the horizontal projection of the +X axis measured clockwise from geographic north. The diversity of paleomagnetic investigations and applications makes it hard to generalize about sample collection, but there are some time-honored recommendations. One obvious recommendation is to collect fresh, unweathered samples. Surface weathering oxidizes magnetite to hematite or iron-oxyhydroxides, with attendant deterioration of NRM carried by magnetite and possible formation of modern CRM. Artificial outcrops (such as road cuts) thus are preferred locations, and rapidly incising gorges provide the best natural exposures. Lightning strikes can produce significant secondary IRM, which can mask the primary remanence. Although partial demagnetization in the laboratory can often erase lightning-induced IRM, the best policy is to avoid lightning-prone areas. When possible, avoid topographic highs, especially in tropical regions. If samples must be collected in lightning-prone areas, effects of lightning can be minimized by surveying the outcrop prior to sample collection to find areas that have probably been struck by lightning. This is done by “mapping” the areas where significant (> 5∘) deflections of the magnetic compass occur. If a magnetic compass is passed over an outcrop at a distance of ~15 cm from the rock face while the compass is held in fixed azimuth, the strong and inhomogeneous IRM produced by a lightning strike will cause detectable deflections of the compass. These regions then can be avoided during sample collection. Figure 9.5: a) Pomeroy orientation device in use as a sun compass. b) Schematic of the principles of sun compass orientation. In general, some direction (drill direction, strike and dip, direction of a horizontal line or even just the “up” direction) is measured on the sample. This direction is here called the field arrow. When samples are prepared into specimens for measurement, the field arrow is often replaced by a lab arrow which is frequently in some other direction. Procedures for orienting the field arrow are varied, and no standard convention exists. However, all orientation schemes are designed to provide an unambiguous in situ geographic orientation of each sample. A variety of tools are used including orientation devices with magnetic and sun compasses, levels for measuring angles from the horizontal and even differential GPS devices for establishing the azimuth of a local baseline without the need for magnetic or sun compasses. Sometimes large local magnetic anomalies, for example from a strongly magnetized rock unit, can lead to a bias in the magnetic direction that is not compensated for by the IGRF magnetic declination. In such cases, some other means of sample orientation is required. One relatively straightforward way is to use a sun compass. Calculation of a direction using a sun compass is more involved than for magnetic compass, however. A dial with a vertical needle (a gnomon) is placed on the horizontal platform shown in Figure 9.5. The angle (α) that the sun’s shadow makes with the drilling direction is noted as well as the exact time of sampling and the location of the sampling site. With this information and the aid of the Astronomical Almanac or a simple algorithm (see Appendix A.3.8), it is possible to calculate the desired direction to reasonable accuracy (the biggest cause of uncertainty is actually reading the shadow angle!). Another way to avoid the deflection of the compass needle by strong local magnetic anomalies is to check the direction by sighting to known landmarks or by moving a second magnetic compass well away from the outcrop and back-sighting along the drill direction. This is easiest by using the sun-compass gnomon and sighting tip of the original compass as guides (see Figure 9.6). The original magnetic compass direction (near the outcrop) can be compared to the backsighted direction in order to detect and remove any deflection. Of course the compass reading made with the orientation device (near outcrop) is more precise (~ 3∘), but backsighting can be done with a precision of ~ 5∘ with care. 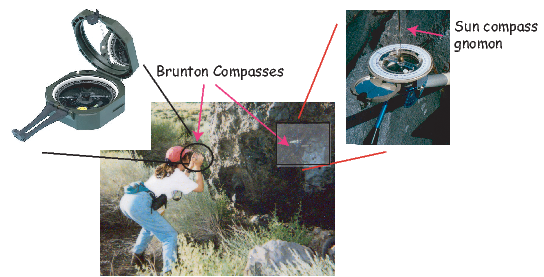 Figure 9.6: Back-sighting technique using a Pomeroy orientation device and two Brunton Compasses. One is used with the Pomeroy to measure the direction of drill and the other is used to check for deflection caused by local magnetic anomalies. Figure 9.7: Differential GPS system for orienting paleomagnetic samples in polar regions. Photo taken during sampling trip to the foothills of the Royal Society Ranges in Antarctica, Jan. 2004. A new technique, developed by C. Constable and F. Vernon at Scripps Institution of Oceanography (see Lawrence et al. 2009) uses differential Global Positioning System (GPS) technology (see Figure 9.7) to determine the azimuth of a baseline. Two GPS receivers are attached to either end of a one meter long non-magnetic rigid base. The location and azimuth of the baseline can be computed from the signals detected by the two receivers. The orientation of the baseline is transferred to the paleomagnetic samples using a laser mounted on the base which is focused on a prism attached to the orientation device used to orient the paleomagnetic samples. The orientations derived by the differential GPS are nearly identical to those obtained by a sun compass, although it takes at least an additional half hour and is rather awkward to transport. 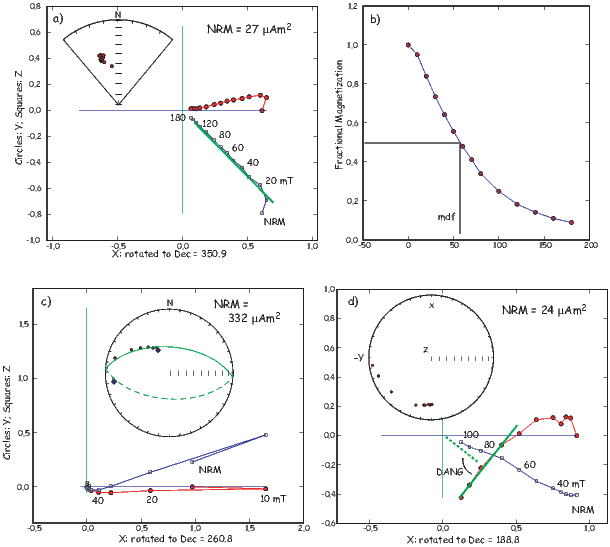 Nonetheless, achieving sun-compass accuracy in orientations when the sun is unlikely to be readily available is a major breakthrough for high latitude paleomagnetic field procedures. Figure 9.8: Various types of possible specimen shapes and orientation conventions. a) A one inch slice from a drilled core. b) A cubic specimen of sediment sanded from a hand sample. c) A specimen (also sample) from a piston core. Samples are brought to the laboratory and trimmed into standard sizes and shapes (see Figure 9.8). These sub-samples are called paleomagnetic specimens. A rule of thumb about terminology is that a sample is something you take and a specimen is something you measure. The two may be the same object, or there may be multiple specimens per sample. A site is a single horizon or instant in time and may comprise multiple samples or may be only a single sample, depending on the application. Multiple specimens from a single site are expected to have recorded the same geomagnetic field. We measure the magnetic remanence of paleomagnetic specimens in a rock magnetometer, of which there are various types. The cheapest are spinner magnetometers so named because they spin the specimen to create a fluctuating electromotive force (emf). The emf is proportional to the magnetization and can be determined relative to the three axes defined by the sample coordinate system. The magnetization along a given axis is measured by detecting the voltages induced by the spinning magnetic moment within a set of pick-up coils. Another popular way to measure the magnetization of a specimen is to use a cryogenic magnetometer. These magnetometers operate using so-called superconducting quantum interference devices (SQUIDs). In a SQUID, the flux of an inserted specimen is opposed by a current in a loop of superconducting wire. The superconducting loop is constructed with a weak link which stops superconducting at some very low current density, corresponding to some very small quantum of flux. Thus the flux within the loop can change by discrete quanta. Each incremental change is counted and the total flux is proportional to the magnetization along the axis of the SQUID. Cryogenic magnetometers are much faster and more sensitive than spinner magnetometers, but they cost much more to buy and to operate. 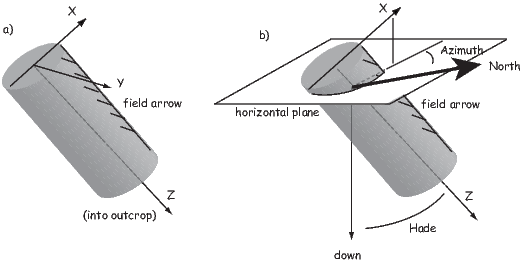 Magnetometers are used to measure the three components of the magnetization necessary to define a vector (e.g., x1,x2,x3 or equivalently x,y,z). These data can be converted to the more common form of D, I and M by methods described in Chapter 2. Data often must be transformed from the specimen coordinate system into, for example, geographic coordinates. This can be done graphically with a stereonet or by means of matrix manipulation. We outline the general case for transformation of coordinates in Appendix A.3.5. Here we examine the specific cases of the transformation from specimen coordinates to geographic coordinates and the transformation of geographic coordinates to tilt corrected coordinates, the two most commonly used rotations in paleomagnetism. 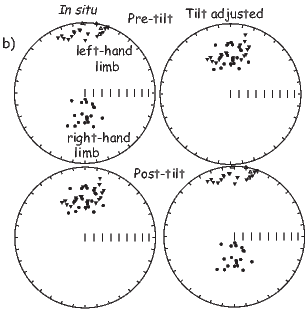 No matter how the sample was taken, data in the laboratory are measured with respect to the specimen coordinate system, so all the field arrows, no matter how obtained, must be converted into the direction of the lab arrow (x; see example in Figure 9.4 and Figure 9.8a for field drilled samples.) Suppose we measured a magnetic moment m (Figure 9.9a). The components of m in specimen coordinates are x,y,z or equivalently, x1,x2,x3. Ordinarily, this coordinate system is at some arbitrary angle to the geographic coordinate system, but we know the azimuth and plunge (Az,Pl) of the lab arrow with respect to the geographic coordinate system (Figure 9.9b). By substituting Az and Pl for ϕ and λ into Equation A.13, the components of the direction of m in geographic coordinates can be calculated. These then can be converted back into D,I and m using the equations given in Chapter 2. Note that m stays the same during the transformation of coordinates. To correct for tilt, it is simplest to understand if this is performed as three rotations. This is how it is done graphically with a stereonet and it is possible to do it the same way with a computer. [It can also be done as a single rotation, which would be computationally faster, but much harder to visualize.] First, rotate the direction of magnetic moment in specimen coordinates about a vertical axis by subtracting the dip direction from the declination of the measurement. Then substitute ϕ = 0 and λ = - dip into Equation A.13 to bring the dip back up to horizontal. Finally, rotate the direction back around the vertical axis by adding the dip direction back on to the resulting rotated declination. Figure 9.9: a) Specimen coordinates with X1 being along the “lab arrow”. A magnetic moment m was measured relative to the specimen coordinate system with components x1,x2,x3. The orientation of the lab arrow with respect to geographic coordinates (X′1 = N) is specified by the azimuth and plunge (Az,Pl) of the lab arrow. Figure 9.11: a) Solid (open) symbols are horizontal (vertical) projections respectively. Peak alternating fields for each demagnetizing step (in mT) are indicated. Inset is equal area plot of the same data. Solid (open) symbols are projections onto the lower (upper) hemisphere. b) Intensity as a function of demagnetization step. Data from a). The median destructive field (mdf of Chapter 8) also shown. c) Specimen with two components with overlapping stabilities. Inset as in a). Best fit great circle is shown as the curve through the data (dashed portion is upper hemisphere projection). d) Data from specimen showing evidence of GRM (see Chapter 7). During demagnetization, the vector grows perpendicular the last demagnetization direction (-Y). Deviation ANGle, DANG also shown. Anyone who has dealt with magnets (including magnetic tape, credit cards, and magnets) knows that they are delicate and likely to demagnetize or change their magnetic properties if abused by heat, large magnetic fields or stress. Cassette tapes left on the dashboard of the car in the hot sun never sound the same. Credit cards that have been through the dryer may lead to acute embarrassment at the check-out counter. Magnets that have been dropped, do not work as well afterwards. It is not difficult to imagine that rocks that have been left in the hot sun or buried deep in the crust (not to mention altered by diagenesis or bashed with hammers, drills, pick axes, etc. ), may not have their original magnetic vectors completely intact. Because rocks often contain millions of tiny magnets, it is possible that some (or all) of these have become realigned, or that they grew since the rock formed. In many cases, there are still grains that carry the original remanent vector, but there are often populations of grains that have acquired new components of magnetization. The good news is that viscous magnetizations are carried by grains with lower magnetic anisotropy energies (they are “softer”, magnetically speaking), so we expect their contribution to be more easily randomized than the more stable (“harder”) grains carrying the ancient remanent magnetization. There are several laboratory techniques that are available for separating various components of magnetization. Paleomagnetists rely on the relationship of relaxation time, coercivity, and temperature in order to remove (demagnetize) low stability remanence components. The fundamental principle that underlies demagnetization techniques is that the lower the relaxation time τ, the more likely the grain will carry a secondary magnetization. The basis for alternating field (AF) demagnetization is that components with short relaxation times also have low coercivities. The basis for thermal demagnetization is that these grains also have low blocking temperatures. In AF demagnetization, an oscillating field is applied to a paleomagnetic specimen in a null magnetic field environment (Figure 7.22 in Chapter 7). All the grain moments with coercivities below the peak AF will track the field. These entrained moments will become stuck as the peak field gradually decays below the coercivities of individual grains. Assuming that there is a range of coercivities in the specimen, the low stability grains will be stuck half along one direction of the AF and half along the other direction; the net contribution to the remanence will be zero. In practice, we demagnetize specimens sequentially along three orthogonal axes, or while “tumbling” the specimen around three axes during demagnetization. Thermal demagnetization exploits the relationship of relaxation time and temperature. There will be a temperature below the Curie temperature at which the relaxation time is a few hundred seconds. When heated to this temperature, grains with relaxation times this short will be in equilibrium with the field. This is the unblocking temperature. If the external field is zero, then there will be no net magnetization. Lowering the temperature back to room temperature will result in the relaxation times growing exponentially until these moments are once again fixed. In this way, the contribution of lower stability grains to the NRM can be randomized. Alternatively, if there is a DC field applied during cooling, the grains whose unblocking temperatures have been exceeded will be realigned in the new field direction; they will have acquired a partial thermal remanent magnetization (pTRM). We sketch the principles of progressive (step-wise) demagnetization in Figure 9.10. Initially, the NRM is the sum of two components carried by populations with different coercivities. The distributions of coercivities are shown in the histograms to the left in Figure 9.10. Two components of magnetization are shown as heavy lines in the plots to the right. In these examples, the two components are orthogonal. The sum of the two components at the start (the NRM or demagnetization step ‘0’) is shown as a + on the vector plots to the right. After the first AF demagnetization step, the contribution of the lowest coercivity grains has been erased and the remanence vector moves to the position of the first dot away from the +. Increasing the AF in successive treatment steps (some are numbered in the diagram) gradually eats away at the remanence vectors (shown as dashed arrows and dots in the plots to the right) which eventually approach the origin. There are four different sets of coercivity spectra shown in Figure 9.10, each with a distinctive behavior during demagnetization. If the two coercivity fractions are completely distinct, the two components are clearly defined (Figure 9.10a) by the progressive demagnetization. If there is some overlap in the coercivity distribution of the components the resulting demagnetization diagram is curved (Figure 9.10b). If the two components completely overlap, both components are removed simultaneously and an apparently single component demagnetization diagram may result (Figure 9.10c). It is also possible for one coercivity spectrum to include another as shown in Figure 9.10d. Such cases result in “S” shaped demagnetization curves. Because complete overlap actually happens in “real” rocks, it is desirable to perform both AF and thermal demagnetization. If the two components overlap completely in coercivity, they might not have overlapping blocking temperature distributions and vice versa. It is unlikely that specimens from the same lithology will all have identical overlapping distributions, so multiple specimens can provide clues to the possibility of completely overlapped directions in a given specimen. Now we will consider briefly the issue of what to do with the demagnetization data in terms of display and estimating a best-fit direction for various components. The standard practice in demagnetization is to measure the NRM and then to subject the specimen to a series of demagnetization steps of increasing severity. The magnetization of the specimen is measured after each step. During demagnetization, the remanent magnetization vector will change until the most stable component has been isolated, at which point the vector decays in a straight line to the origin. This final component is called the characteristic remanent magnetization or ChRM. Visualizing demagnetization data is a three-dimensional problem and therefore difficult to plot on paper. Paleomagnetists often rely on a set of two projections of the vectors, one on the horizontal plane and one on the vertical plane. These are variously called Zijderveld diagrams (Zijderveld, 1967), orthogonal projections, or vector end-point diagrams. In orthogonal projections, the x1 component is plotted versus x2 (solid symbols) in one projection, and x1 is replotted versus Down (x3) (open symbols) in another projection. The paleomagnetic convention differs from the usual x-y plotting convention because x3 is on a vertical axis which is positive in the downward direction (instead of the usual positive up convention). The choice of axis for the horizontal projection is a little more tricky. x2 is always positive to the right of x1. x1 is frequently plotted along the horizontal axis and x2 would then be on the vertical axis, again positive in the downward direction. The paleomagnetic conventions make sense if one visualizes the diagram as a map view for the solid symbols and a vertical projection for the open symbols. Because x3 gets plotted against whatever is chosen for the horizontal axis, the angle that the vertical projection makes will only be true inclination if the horizontal axis happens to be parallel to the remanence vector, i.e. directly along x1. For this reason, x2 is sometimes plotted along the horizontal axis if the remanence vector is more parallel to x2. Some people choose to plot the pairs of points (x1,x2) versus (H,x3) where H is the horizontal projection of the vector given by . In this projection, sometimes called a component plot, the coordinate system changes with every demagnetization step because H almost always changes direction, even if only slightly. Plotting H versus x3 is therefore a confusing and misleading practice. The primary rationale for doing so is because, in the traditional orthogonal projection where x3 is plotted against x1 or x2, the vertical component reveals only an apparent inclination. In fact, the choice of horizontal component is arbitrary and could be deliberately chosen to be parallel to the remanence directions. If something close to true inclination is desired, then, instead of plotting H and x3, one can simply rotate the horizontal axes of the orthogonal plot such that it closely parallels the desired declination (Figure 9.11a,b). In the plots shown in Figure 9.11a,c we have rotated the remanence vector such that the x1 component is parallel to the original NRM direction. In Figure 9.11, we show several general types of demagnetization behavior. In Figure 9.11a, the specimen has a North-Northwest and downward directed NRM (see inset of equal area projection in geographic coordinates.) The direction does not change during demagnetization and the NRM is a single vector. The median destructive field (from Chapter 8) is illustrated in Figure 9.11b. The specimen in Figure 9.11c shows a progressive change in direction from a Westward and up directed component to a North and down direction. The vector continuously changes direction to the end and no final “clean” direction has been confidently isolated. These data are plotted on an equal area projection in the inset along with the trace of the best-fitting plane (a great circle). The most stable component probably lies somewhere near the best-fitting plane. This specimen came from the outcrop depicted in Figure 7.19 in Chapter 7 which had been hit by lightning. The presumptive IRM is much “softer” on demagnetization; the NRM is virtually erased by 40 mT, whereas the mdf of the specimen that had not been hit by lightning is much higher (Figure 9.11a,b). The NRM of the lightning hit specimen is also more than an order of magnitude stronger. The behavior of the specimen shown in Figure 9.11d is again markedly different in that the intensity, after an initial smooth decrease, begins to climb again at high demagnetizing fields. The direction deflects away from the origin towards a direction that is orthogonal to the last axis to be demagnetized. This behavior is typical of GRM acquisition during demagnetization (see Chapter 7). When specimens acquire a remanence either along the axis of the oscillating field (an ARM) or orthogonal to it (a GRM as in Figure 9.11d) they require a more complicated demagnetization regime than just along the three axes. In the case of the parallel acquisition, a double demagnetization protocol works well. In double demagnetization (e.g., Tauxe et al., 2004), a specimen is subjected to demagnetization along the three orthogonal axes, say along +X1,+X2,+X3, and is measured, then demagnetized along -X1,-X2,-X3 and remeasured. The two measurements are averaged to give an ARM free vector. In the case of GRM, Stephenson (1993) developed a triple demagnetization protocol whereby specimens are demagnetized along +X1,+X2,+X3 measured, then demagnetized along +X2, measured and finally along +X1 and measured. These three steps are averaged to give a GRM-free vector. This method is a simplified but at times sufficient variation of the six step procedure described by Dankers and Zijderveld (1981). GRMs have been associated with specimens that have a high anisotropy (e.g., Stephenson, 1993; Tauxe et al., 2004; Potter and Stephenson, 2005), or have a greigite magnetic remanence (e.g., Snowball, 1997). An equal area projection may be the most useful way to present demagnetization data from a specimen with several strongly overlapping remanence components (such as in Figures 9.11c-d). In order to represent the vector nature of paleomagnetic data, it is necessary to plot intensity information. Intensity can be plotted versus demagnetization step in an intensity decay curve (Figure 9.11b). However, if there are several components with different directions, the intensity decay curve cannot be used to determine, say, the blocking temperature spectrum or mdf, because it is the vector sum of the two components. It is therefore advantageous to consider the decay curve of the vector difference sum (VDS) of Gee et al. (1993). The VDS “straightens out” the various components by summing up the vector differences at each demagnetization step, so the total magnetization is plotted, as opposed to the resultant. Figure 9.12: Sampling units with different bedding attitudes in the “fold test”. 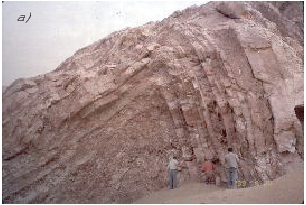 a) Example of folded beds. [Photo from G. Dupont-Nivet.] b) Hypothetical paleomagnetic directions are shown on equal area projections before and after adjusting for bedding tilt. Top pair represents the case in which the grouping of paleomagnetic directions is improved after adjusting for tilt which would argue for a pre-tilt acquisition of remanence. Lower pair represents a post-tilt acquisition of remanence in which the grouping is worse after restoring beds to the horizontal position. Orthogonal vector projections aid in identification of the various remanence components in a specimen. Demagnetization data are usually treated using what is known as principal component analysis (Kirschvink, 1980). This is done by calculating the orientation tensor for the set of data and finding its eigenvectors (Vi) and eigenvalues (τi); see Appendix A.3.5 for computational details. What comes out of the analysis is a best-fit line through a single component of data as in Figure 9.11a,b or a best-fit plane (or great circle, if each point is given unit weight) through multi-component data as in Figure 9.11c,d. Kirschvink  also defined the maximum angle of deviation or (MAD) for each of these. 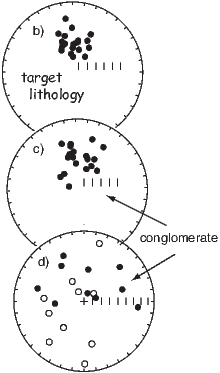 Figure 9.13: The paleomagnetic conglomerate test. a) The target lithology was involved in a catastrophic event leading to incorporation into a conglomerate bed. Samples are taken from individual clasts. The directions of samples from the target lithology are shown in b) indicating that it is relatively homogeneously magnetized. c) Directions from the conglomerate clasts are also homogeneously magnetized; the magnetization must post-date formation of the conglomerate. In a positive conglomerate test d), the magnetization vectors of samples from the conglomerate clasts are random. The angle between the best-fitting line through the data and the origin is termed the Deviation ANGle or DANG. The line connecting the data to the origin is taken as the vector from the origin to the center of mass of the data (Equation A.15). Figure 9.14: The baked contact test. 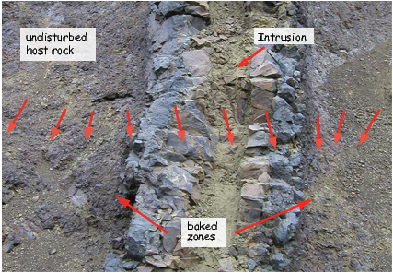 In a positive test, zones baked by the intrusion are remagnetized and have directions that grade from that of the intrusion to that of the host rock. If all the material is homogeneously magnetized, then the age of the intrusion places an upper bound on the age of magnetization. In addition to establishing that a given rock unit retains a consistent magnetization, it is also important to establish when this magnetization was acquired. Arguments concerning the age of magnetic remanence can be built on indirect petrographic evidence as to the relative ages of various magnetic minerals, or by evidence based on geometric relationships in the field. There are two popular field tests that require special sampling strategies: the fold test and the conglomerate test. The fold test (also known as a tilt test) relies on the tilting or folding of the target geological material. 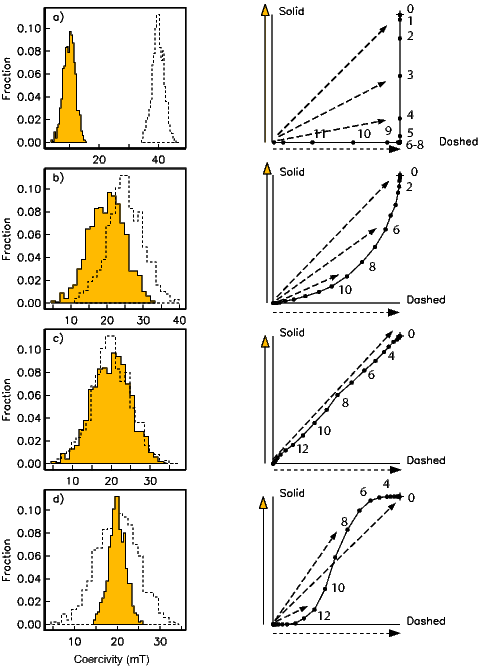 If, for example, one wanted to establish the antiquity of a particular set of directions, one could deliberately sample units of like lithology, with different present attitudes (Figure 9.12). If the recovered directions are more tightly grouped before adjusting for tilt (as in the lower left panel), then the magnetization is likely to have been acquired after tilting. On the other hand, if directions become better grouped in the tilt adjusted coordinates (see upper right panel), one has an argument in favor of a pre-tilt age of the magnetization. Methods for quantifying the tightness of grouping in various coordinate systems will be discussed in later chapters. In the conglomerate test, lithologies that are desirable for paleomagnetic purposes must be found in a conglomerate bed (Figure 9.13a). In this rare and happy circumstance, we can sample them and show that: 1) the rock magnetic behavior is the same for the conglomerate samples as for those being used in the paleomagnetic study, 2) the directions of the studied lithology are well grouped, (Figure 9.13b) and 3) the directions from the conglomerate clasts are randomly oriented (see Figure 9.13d). If the directions of the clasts are not randomly distributed (Figure 9.13c), then presumably the conglomerate clasts (and, by inference, the paleomagnetic samples from the studied lithology as well) were magnetized after deposition of the conglomerate. We will discuss statistical methods for deciding if a set of directions is random in later chapters. The baked contact test is illustrated in Figure 9.14. It is similar to the conglomerate test in that we seek to determine whether the lithology in question has undergone pervasive secondary overprinting. When an igneous body intrudes into an existing host rock, it heats (or bakes) the contact zone to above the Curie temperature of the host rock. The baked contact immediately adjacent to the intrusion should therefore have the same remanence direction as the intrusive unit. This magnetization may be in an entirely different direction from the pre-existing host rock. The maximum temperature reached in the baked zone decreases away from the intrusion and remagnetization is not complete. Thus the NRM directions of the baked zone gradually change from that of the intrusion to that of the host rock. Such a condition would argue against pervasive overprinting in the host rock that post-dated the intrusion, and the age of the intrusion would provide an upper bound on the age of remanence in the host rock. SUPPLEMENTAL READINGS: Collinson (1983), Chapters 8 and 9. Before you start, make sure you have the most recent distribution of the PmagPy software (see PmagPy website) and see instructions in the Preface for help in accessing the data files. Find the data files for these problems in the Chapter_9 directory. The remanence vectors in the Chapter_9 directory saved in zijd_example.csv were measured during the thermal demagnetization of a specimen. The first column is the specimen name. The second is the temperature to which the specimen was heated, before cooling in zero field. The next columns are intensity, declination and inclination respectively for each treatment step. a) Write a python program in a Jupyter notebook to make a Zijderveld diagram. Follow these steps: 1) Read in the data. 2) Convert the vectors to x,y,z. 3) Plot x versus -y using some solid symbol and then connect those dots with a line. This is the horizontal projection of the vector so x should be on the horizontal axis and -y should be up. (Think about this! You are plotting a map view and Y is the East direction. So +y should be to the right of x.) 4) Now plot x versus -z. Here again the projection is unusual because +z is the down direction. Therefore it should be down. [It is -z that is up!] Use a different (open) symbol for these points and plot them on the same plot as your x,y data. b) The same data were saved without headers in a file named zijd_example.dat. Plot them using the program ipmag.zeq. [Hint: check the help message by typing help(ipmag.zeq) to figure out how...]. Compare your answer from Problem 1a with that produced by the PmagPy program ipmag.zeq. Re-write your program until it is right; you can cheat by looking in ipmag.zeq and in the two function modules pmag.py and pmagplotlib.py if you have to, but make your program “your own”. c) Assuming these data have already been converted to geographic coordinates (x = N,y = E,z = V ), what is the approximate direction (e.g. NE and up) of the low stability component of magnetization? The high stability component of magnetization? What is the most likely remanence carrying mineral in this specimen? Thinking about what you learned about VRM in Chapter 7, for the low stability component to be a VRM acquired over the last million years, at what temperature would the rock have to have been held to acquire this component viscously over a million years? c) Run ipmag.zeq again, this time setting the -begin_pca and -end_pca flags to calculate best-fit lines through the two components and a great circle through all the data except the NRM and last steps. Look at these new images in your notebook. In a markdown code block explain which interpretation makes the most sense? Use the program pmag.dosundec from within a notebook to estimate what the drilling azimuth was using the following sun compass information: You are located at 35∘ N and 33∘ E. The local time is three hours ahead of Universal Time, so we subtract -3 from local time. The shadow angle for the drilling direction was 68∘ measured at 16:09 on May 23, 1994. D = 336∘, I = -2∘, bedding dip = 41∘, dip direction = 351 ∘. Plot the NRM direction on an equal-area projection (see Appendix B.1). Then using the procedures outlined in Appendix B1.3 (or slight modifications thereof), to determine the “structurally corrected” direction of NRM that results from restoring the strata to horizontal. b) Check your answer with the function pmag.dotilt. Now consider a more complex situation in which a paleomagnetic site has been collected from the limb of a plunging fold. On the east limb of a plunging anticline, a direction of NRM is found to be I = 33∘, D = 309∘. The bedding attitude of the collection site is dip = 29∘, strike = 210∘ (dip direction = 120∘, and the pole to bedding is azimuth = 300∘, inclination = 61∘). The trend and plunge of the anticlinal axis are trend = 170∘, plunge = 20∘. Determine the direction of NRM from this site following structural correction. To do this, first correct the NRM direction (and the pole to bedding) for the plunge of the anticline. Rotate the fold axis to horizontal first. Then complete the structural correction of the NRM direction by restoring the bedding (corrected for plunge) to horizontal. Use the function pmag.dotilt() to do your rotations in an Jupyter notebook. The import command can be put at the beginning of the program as always. Use your programs to convert direction to cartesian coordinates and back again. Compare your answer to the one given by pmag.dogeo and pmag.dotilt that are callable from within your notebook. Rewrite your code until you have it right. NB: pmag.dotilt.py uses dip and dip direction instead of strike and dip. These are completely interchangeable, but dip and dip direction is unique, while strike and dip requires some convention like “dip to right of strike” and can make for confusion if you are used to a different convention). Figure 9.15: Paleomagnetic site NS034. a) Photo of the “red” team. b) Photo showing sample holes with labels. The picture was taken in an easterly direction (see look direction in notebook page.) c) Page from the notebook. An intrepid group called “the red team” sampled a lava flow on Bastille day in 2006. The team, the sampling sites and the notebook page are shown in Figure 9.15a,b and c respectively. 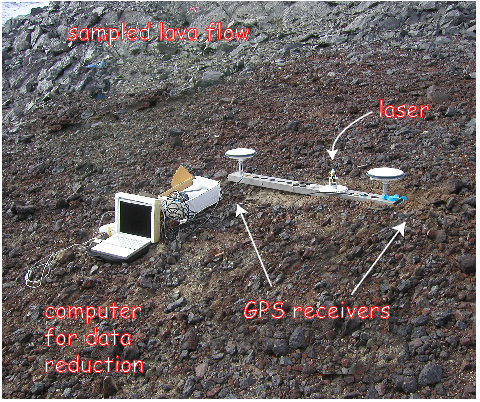 In this problem we will look at some real data collected from this lava flow. a) Make a new directory in your homework directory for this problem. Do not include spaces in the directory name! Run the Pmag GUI graphical user interface by typing pmag_gui.py on the command line. [Note that PC users may have to omit the .py termination.] This problem does not use the Jupyter notebook! b) Convert your data files to the MagIC format. The measurements were made in the SIO paleomagnetic laboratory in the SIO lab format. Specimens were demagnetized using the AF and thermal methods and the data are in the Chapter_9 directory, named ns_a.mag and ns_t.mag respectively. Click on the button labeled ‘1. convert magnetometer files....’ and choose the ‘SIO format’ before clicking on ‘Import file’. Click on ‘add’ and select ns_a.mag to start. Check the ‘AF Demag’ box. If you open the file you will see that the specimen names have the format: ns034a1. The terminal number distinguishes this from the sample, ns034a and the terminal letter distinguishes the sample from the site, ns034. So choose the number of terminal characters.... to be ‘1’. The default sample-site naming convention of XXXXY is already correct. Now fill in the Location name to be ‘North Shore Volcanics’ and click on ‘OK’ at the bottom of the page. Repeat this procedure for the thermal demagnetization data. Be sure to click on the ‘Thermal (includes thellier but not trm)’ button instead of AF Demag. After clicking on ‘OK’, select ‘Next step’ and click on ‘OK’ to combine both measurement files into a single file. Skip the panel ‘Step 3:’ by clicking on ‘OK’ to complete the conversion step. c) Click on the button labelled ‘2. Calculate the geographic/tilt-corrected directions’. Here you could fill out the form using the notebook information in Figure 9.15. But someone has typed in all the data you need for you. They are in the ‘Orientation file’ named ‘orient.txt’ in the Chapter_9 directory. Click on the button ‘Import Orientation File’ and select that file. This should fill in the most of the information for you. Note that the red team’s convention was to mark a sample with a ~ if it broke off before orientation and to put the method code ‘SO-GT5’ in the magic_method_codes column. All “sample_flag”s are set to ’g’ (good) by default. Click on ‘Save Orientation File’ and then ‘Calculate Sample Orientations’. These samples were oriented with a Pomeroy orientation device, so, select the first option under orientation convention. The magnetic declination of the compass was set to 0 (notebook entry says “MagDec set to zero”. ), so we need to correct all the information for magnetic declination. Select “Use the IGRF value at the lat/long and date supplied” option. You will need to supply the hours to subtract from local time to get to GMT here because all the sampling times were in local time. The entry in the notebook page says that GMT is five hours ahead of local time, so enter “-5” here. Click on ’OK’. You can enter a number of sampling codes. Here, select field drilling, location with GPS, Pomeroy orientation device options. There is only one bedding plane estimate, so skip the bedding averaging option. d) Look at the demagnetization data. Click on the ‘Demag GUI’ button. You should have a panel of plots including a Zijderveld plot, an equal area projection with all the demagnetization directions, a intensity decay curve, and a blank site level equal area projection. You will see a list of data to the left. You can toggle the orientation from geographic to specimen or stratigraphic (tilt corrected) by choosing the coordinate system. You can also change the declination for the horizontal axis of the Zijderveld diagram with the Zijderveld plot pull down menu. The default is to use the X=East direction. Calculate the best fit direction for this specimen by first clicking on the ‘add fit’ interpretation option and selecting data from the second demagnetization step to the end in the ‘bounds’ drop down menus at the top left of the panel. Choose the default to calculate a best-fit line by simply leaving the Interpretation Type set to ‘line’. You will see the data re-plotted with the best-fit line. Save the interpretation by clicking on the ‘save’ button. Step through all the data until you have interpreted all the specimens. If you set ‘Mean Options’ to Fit 1, how each interpretation shows up in the site window. Under the ‘File’ menu, select ‘Save MagIC tables’. Use the default age of 1100 Ma for these rocks. Calculate the site mean by averaging all the specimens with Fisher statistics. Then click on ‘OK’. Exit the program by selecting the ‘Quit Demag-gui’ option under the ’File’ menu. e) Explore the MagIC database tables that you have created. Look at the chapter on the MagIC database and file formats in the PmagPy cookbook. Click on the Pmag GUI’s button ‘3. fill Earth-Ref data’ and verify the relationship of the specimens to the samples. Click on ‘Save and continue’. Repeat this for Step 2. For Step 3, you must insure that site ‘ns034’ belongs to ‘North Shore Volcanics’, which you must add with the ‘Add a new location’ button. Then click on the cell below locations and select that. These were extrusive igneous rocks, so select those options for the site_class column. find ‘Basalt’ under the site_lithology column and ‘Lava Flow’ for site_type. Then click on ‘Save and continue. Step 4 allows you to verify that everything you have done was propagated correctly to the site level. Click on ‘Save and continue’. For step 5, you must let the program know what type of location these samples were taken from, so select ‘Outcrop’ under that column. Then select ‘Save and continue’. Step 6 deals with ages. Fill in stratigraphic correlation for the geochronology method (GM-CC-STRAT), Ga for the age_unit and 1.1 for the age. Click on ‘Save and continue’ to finish. You can explore your handiwork by looking at the files created in your homework directory with Excel or some other spreadsheet program.